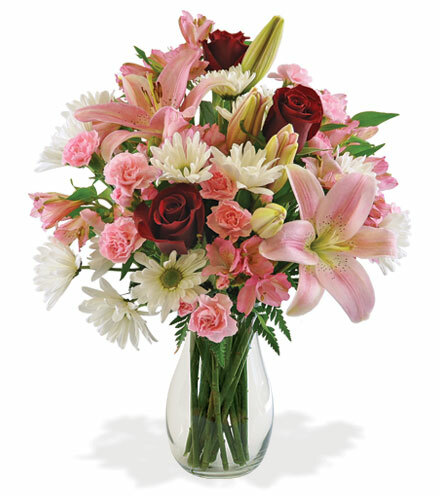 Make someone’s day with this sweet combination of soft pink carnations, lilies, and alstroemeria arranged with white daisies and dotted with deep red roses. This gorgeous flower arrangement is full of fresh blooms that radiate with joy and cheerful sentiment. Send heartfelt wishes to friends and loved ones in honor of an anniversary, birthday, or to extend warm wishes of thanks. If you know someone who is a fan of the sweet color of pink mixed with an elegant red, this arrangement will surely make their day.